Aphasia is one of the most difficult problems to deal with following a stroke. It is often present when the injury affects the left hemisphere of the brain, and is sometimes even present in less pronounced forms in the case of injuries affecting the right hemisphere, provided that the patient is left-handed. The pages of this website that deal with the hemiplegic patient’s movement-related problems always call attention to the fact that the problems do not depend upon the muscles, but are rather the result of an alteration of the cognitive abilities that organize the patient’s behaviour. Behaviour consists of the series of actions that allow us to interact with the physical and social environment. Movements, which range from the simplest to the most complex, are the elementary components of an action, and therefore any form of rehabilitation that is only focused upon muscular contraction, or the evocation of a movement outside the context of the action itself, will only partially address the overall problem of recovery. I have included this foreword on movement because speech must be interpreted in the same manner, as a form of behaviour that allows us to communicate and interact within our social environment. Just like movement, speech cannot be reduced to a mere combination of sounds, words and phrases, but must be interpreted from a broader perspective, which not only includes the patient, but his/her interlocutors as well. When we perform a movement, a fascinating process is triggered, which we must understand in order to properly configure the recovery exercises. Every form of behaviour that we have arises from a need that we have to satisfy, and from there we analyse the context in which we will perform the action, including all the useful information that we are able to obtain at that time through our body. After this analysis, and before effectively performing the action, we envisage how the action will be performed, as well as the relative results, in a sort of preview of the gesture itself; a representation. At this point we are able to carry out the action in question, while at the same time keeping in mind that which we had envisaged, in order to be able to “adjust our aim” accordingly if the action and the representation do not perfectly coincide. This process of Behavioural Action is valid for both movement and communication. For the purposes of speech recovery, therefore, the problem must be interpreted from a broader perspective, and not based on the mere production of sounds or words. An aphasic patient hasn’t forgotten the words or the phrases, but instead has problems organizing the behavioural action on various levels as a result of the stroke. Therefore, asking the patient to repeat words as a form of imitation does not take the entire context of the communication into account, and only has partial value as a therapeutic activity. Those who live with aphasic patients know for a fact that being able to say a word by way of imitation or repetition is quite different from being able to use it on the spot and in the appropriate context, when it is actually needed. Aphasia poses a significant problem to the rehabilitation process, because in addition to the speech therapist, it also creates difficulties for the physiotherapist dealing with the motor aspects, as it renders the therapy much more complicated. This topic is discussed in greater depth in the article describing how aphasia exposes the patient to inadequate rehabilitation. The article dedicated to apraxia, on the other hand, contains an example of an exercise performed with an aphasic patient. 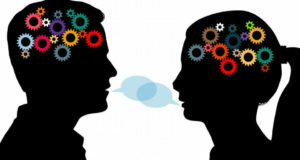 It must be kept in mind that speech is communication, or rather an individual’s ability to convey and receive information through his/her relationship with another party, and our recovery activities must therefore consider communication as an action carried out between the patient and his/her interlocutor. Recovering the ability to speak without inserting it within a communicative context will once again merely result in a partial therapeutic approach. We know that there are various types of aphasia, which depend upon the type of injury that the patient has suffered. These can be schematically divided into motor aphasia, in which the injury involves the areas at the front of the brain (Broca’s area) and the speech disorder is attributable to difficulties organizing the movements of the speech apparatus to produce the necessary sounds, and sensory aphasia, in which the injury involves the areas at the back of the brain (Wernicke’s area) and the speech disorder is associated with comprehension. In this latter case, the patient is often capable of speaking, but his/her speech, despite being fluent and with proper intonation, may be entirely devoid of meaning. There are also injuries that involve both of these areas, and result in what is known as global aphasia. Like with the recovery of movement, in which the ability to perceive and understand the body is essential for being able to reconstruct the movement itself, we can only hope to recover the ability to speak if the patient is capable of understanding words, phrases, and meanings. Therefore, the first “brick” to be laid in the speech recovery process is that of comprehension. We will initially perform speech exercises in which the comprehension requirements are based on extremely simple forms of speech, with the alternation of a subject and a verb, after which we will move on to increasingly complex verbal expressions. When I encounter the family members of patients suffering from aphasia, I typically ask them: “how is the patient’s comprehension?” To which they often reply: “100% perfect”, after which I meet with the patient and find out that he/she has various comprehension disorders. This is because family members tend to know their loved ones’ needs and expressions very well, and this can sometimes conceal a number of the patient’s comprehension disorders. In fact, not all forms of speech have equal value. For example, many patients experience greater difficulties understanding spatial instructions (i.e. above, below, behind, in front of), instructions relating to parts of the body, or even temporal instructions (before, after, during). The second step to recovery deals with an extremely important issue, which even has to do with the recovery of motor behaviour. In fact, in order to facilitate communication with the physiotherapist, and allow for the preparation of exercises that are suitable for the needs of the patient with whom we are apparently unable to communicate, it is necessary to recover the ability to point as an element of communication. Just like children who are not yet able to speak use their fingers to point to the things that they want. This ability is sometimes rendered even more complicated by the disorders associated with apraxia. At this point we focus upon the problems encountered by patients who have problems with comprehension. In fact, the ability to coherently respond to a YES or NO question is an essential element of communication. We often find that these types of answers are no longer easy for patients to produce. In these cases, the patients will sometimes resort to standardized speech, which they use for every occasion. Other times they will replace the word YES with another sound, like EH. Sometimes the use of the words YES and NO is not even coherent, thus making communication a game of chance, even among family members. Now we’ll see a brief excerpt from one of the speech therapy exercises contained in the video guide for the recovery of right hemiplegia and the basic functions of speech, which is just one example of the many activities that can be carried out with aphasic patients. It should be noted that during this initial phase we try to focus upon comprehension and the coherent use of the words YES and NO, all within a communicative context in which the interlocutor also plays a fundamental role, and in which the patient is not asked to say any words by way of imitation or repetition, but is instead focused upon informing his/her interlocutor about something they don’t know, because that’s essentially what communication is all about: informing another party about something they don’t know using a known context. The communicative tension is lost, on the other hand, when there is no communicative act or underlying question.